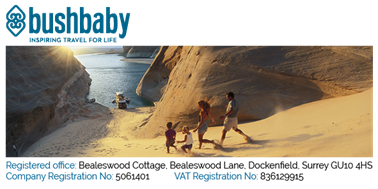 Abi Shaw set up Bushbaby Travel in 2004, with no travel industry experience, just a complete love of exploring the world and desire not to give up long haul adventures after having a baby! Abi has now expanded the tour operation business beyond travelling with little ones to families with children of all ages and also couples whose children have ‘flown the nest’. Their destinations are world-wide, but still focusing on multi-location adventures usually incorporating wildlife, culture, activity and beach. The Bushbaby aim is to inspire parents to consider something new and build shared memories with their children whilst giving them the confidence to take the plunge, as their itineraries are tried and tested and incorporate great attention to detail whether it be car seats / bedding / access to Wifi! Any staff employed by a Chamber member can benefit from a 5% discount on their accommodation, when booked by 31st March!